Spain are into the UEFA European Championship final for the first time since 1984 after overcoming the challenge of Russia in rainy Vienna. Andrés Iniesta created the opening goal for his FC Barcelona team-mate Xavi Hernández five minutes into the second period at the Ernst-Happel-Stadion before substitute Daniel Güiza and David Silva added further goals in the final 17 minutes. After the gritty performance and penalty shoot-out victory against Italy last weekend, Spain put in a commanding display on Thursday in Vienna to see off tournament upstarts Russia. The celebrations back home started after David Silva scored the third goal with eight minutes left to end any possibility of a comeback following strikes by Xavi Hernández and Daniel Güiza. Fireworks crackled across the night sky before the final whistle and residents of Spain's major cities were treated to another long evening of blaring car horns and raucous chanting. "This team isn't the ugly duckling anymore, the eternal losers in Spanish sport," said sports daily AS. "Now they are at the forefront because they win, but above all because they have turned football into a fine art." Biking has been limited to commuting while Euro 2008 is in full swing. I just can't tear myself away from the matches. I have been a Dutch fan since their great run at the World Cup in "74" and "78". Johann Cryuff and company captured my imagination with thier wide open play. This squad may be better than those dream teams. 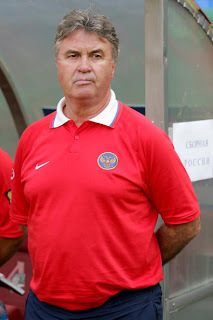 The Dutchman, Gus Hiddink, who worked wonders with South Korea in the 2002 World Cup is leading the Russians against his homeland. "I want to be the traitor of the year in Holland," joked Guus Hiddink. For this evening in Basel, Russia's Dutch coach will attempt to beat the Netherlands in the UEFA EURO 2008™ quarter-finals. The Netherlands sailed through the group stage with three wins and nine goals in Berne, while Russia, having lost their opener 4-1 to Spain, needed a last-day 2-0 defeat of Sweden to reach the last eight. That game was only on Wednesday, while the Oranje beat Romania by the same score the night before – when they were able to rest almost all their regular starters, having already clinched Group C. Despite laughing about knocking out the land of his birth, however, the man who led the Netherlands to the 1998 FIFA World Cup semi-finals knows Marco van Basten's squad have the ability to advance themselves against opponents playing in their first major knockout phase since the end of the Soviet Union. 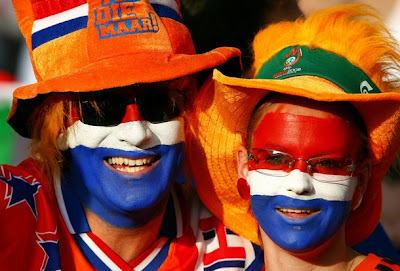 This fan will again be supporting the Dutch with full football ferver. Holy smokes! After yesterday's absolute cracker of a match between Turkey and The Czech Republic, I’m left breathless. ESPN was so enamored that they replayed the match from the beginning straight away- an excellent programming choice, as it was the absolute perfect match for a neutral. Drama, heart, an incredible comeback, an insane last minute ending… I won’t go into it all, and won’t even mention the score- you just have to see it for yourself. Holland is surprising the world with convincing routes of World Champion Italy 3-nil only to exceed that feat by defeating the number 2 team in the world France by an equally lopsided score of 4-1. Portugal the surprise leader of their group and Spain are two unlikely powerhouses. Lot of Americans have been programmed to hate soccer. Stay in our bubble and watch American football and baseball. Both are good, but it's sad that they are missing out on such excitement and ferver. There is nothing like it in any other sport and those of you who have attended your national teams matches, singing your anthems and waiving your flags know what I'm talking about. And it's also a good way to get to know the rest of the world. That's the book I had in front of me when I got tagged by my bike shop wrench friend in Maine, Crum. 3) Find the fifth sentence. 5) Tag five or more people, And acknowledge the person who tagged you. "Maybe Frost is still half buried. He writes poems only at night, when no one can see. No one reads them but Elinor." From "Fall of Frost" by Brian Hall. I am also asked to tag five people and am tempted to tag at least one person who I know would make a big deal out of being tagged and give us all hell for doing this. But I'll just send it off to the really friendly types who I know will gladly play along, just because I am pretty sure, are voracious readers. Here they are. I was sweating bullets getting the bikes ready for our special Tuesday ride with the kids Uncle Terry, who is up from the Smokies for a conference in Boston. The LBS owner said, "stay along the coast" when he heard me moan as I spotted the 101F sign on the bank across the street. When we began riding we noticed the cool breeze instantly took some of the bite out of the heat. Wifey and Terry on the boardwalk. The guy was right though. As soon as we approached the coast the temps became very comfortable. The three of us, (uncle Terry, wifey and I)followed the Village Bike route Brandon and I did two weeks ago in the heavy fog. This time we meandered and noticed that the area seems much more "hoitty toitty". A small house in a field of really big houses. One of the really big houses. We road along the beach for a few miles to The Bayside Restaurant. It's the first certified "green" restaurant in Massachusetts. The outdoor dining area provided a great view of Audubon's Alens Pond Sancturary, Buzzards Bay and the Elizabeth Islands. They serve a variety of flavors from the Buzzards Bay Brewers located two miles away. Earlier in the day, Terry and I took a ride around Fairhaven and split a small order of some really good New England style clam cakes. Smothered in vinegar. That's where we ran into John Kennedy the son of a friend, who was one of the better soccer players of Fairhaven High. Johnrecently returned from a stint working in Taiwan, and he was good enough to help us even out the portions of the clam cakes. The weather certainly cooperated for my midweek day off. Near 80 degrees with a brisk wind and a cloudless sky. It was a day for shell fishing, kite flying and riding to lunch with your best friend. The day began in a dense fog as we set out on the Village Cycle Sunday spin. Today's ride maxed out at 50ish miles and covered four towns and two states. 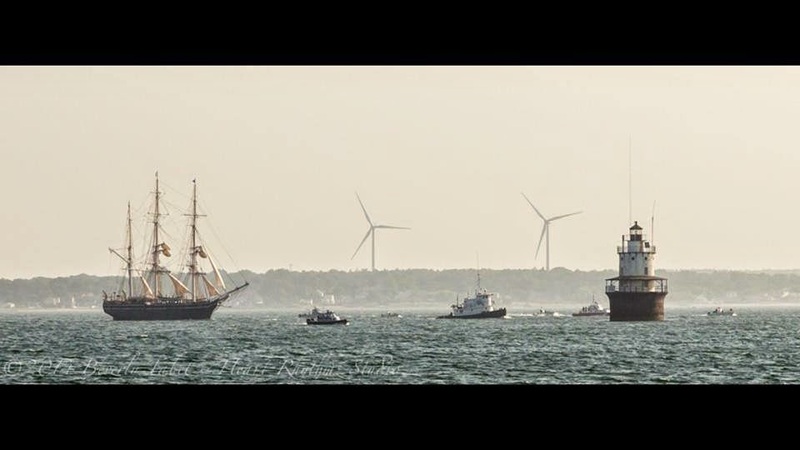 Westport and Dartmouth, MA. as well as Adamsville and Tiverton, R.I.
As usualy the 20+ riders led off followed by the rest and very quickly the groups organized accordingly. I got dropped early when my shoe lace caught in my chain at around the fifth revolution of the pedals. There were plenty of side trips, cut outs and turn around options to satisfy any number of mileage or levels of difficulty. Westport Point is a small portion of the village section of town. A mix of locals (turnips) and summer residents (skewks). Not being of either genre, I find it amusing to watch the bantering between the two groups. Actually, the summer residents are the "Old Yankee" money form New York and Connecticut. Quiet country roads lead to the Acoaxet (ah coax it)Club, a very exclusive private place with golf, tennis, beach and all that. It is located on the point of a peninsula and there was a noticable drop in temperature the cold ocean breeze embraced us. Grand homes and 19th century Inn's were our companions, some beginning to fall into disrepair for who know why. But some are also very well maintained. The thirty mile route we chose took us along the ocean for a bit before bringing us inland through the farm country and rolling hills of Westport. The road to the beach. Finally the sun poked through and it started to get really warm. The homestretch and last hill. As usual, Midnight couldn't contain himself when I came home.